The Faces of Heros carried in the Memorial Day Parade by members of VietNow. Faces of Heros Dispay Case at the LZ Peace Memorial. LZ Peace Memorial at Midway Village, 6799 Guilford Road, Rockford, Illinois. ​The Rockford Chapter NSDAR is happy to have found all of the pictures of the Heroes from Winnebago County who gave their lives in the Vietnam War. 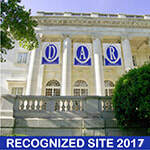 Their information has all been sent to the Washington website. Our mission, however, did not stop there. We have taken the memories and the faces of these young men further than we ever imagined possible when we started this project. Our first display measured five feet by three feet and weighed eighty pounds. It was covered with Plexiglas and framed. 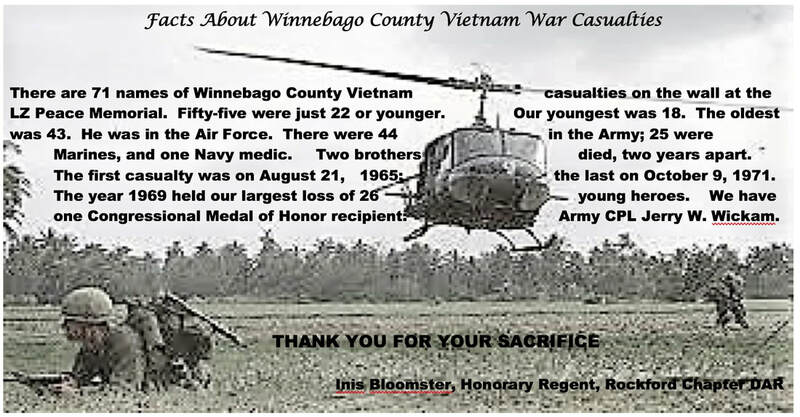 At that time, 62 out of 71 pictures of Winnebago County, Illinois Vietnam Casualties had been found. 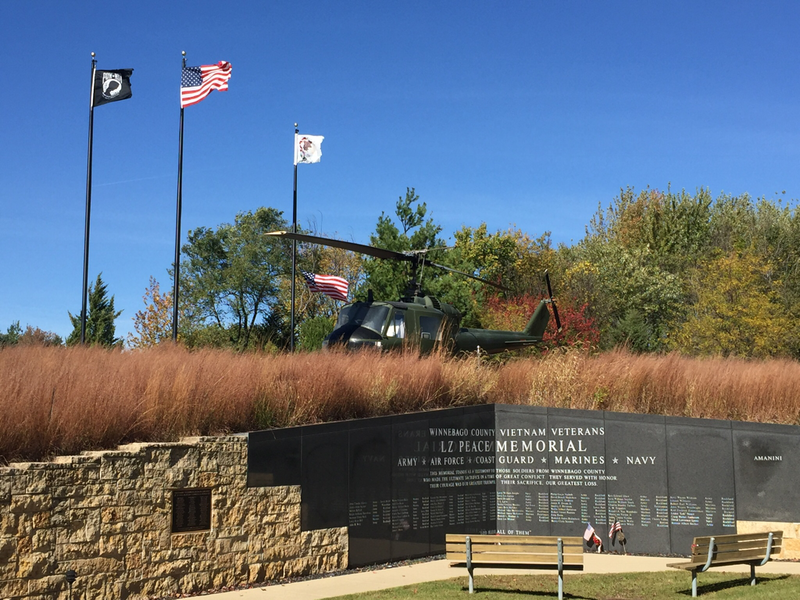 On Memorial Day 2014, the Rockford Chapter NSDAR unveiled the display presenting it to the Vietnam Veterans Honor Society at the LZ Peace Memorial at Midway Village Museum. It was heart-stopping when a Gold Star Mother reached out and touched a picture of her son. One Vietnam Veteran said, “This is a long awaited act of healing”. This endeavor exceeded all expectations. The day after the ceremony, a line formed at the Midway Village Museum to see it. Additionally, it was displayed at the Rockford Airfest Heroes Tent on June 7-8, 2014 honoring Vietnam Veterans. It was also on display at the “Wall of Healing” in Rockford, IL on September 11, 2014. On Memorial Day in 2015, a display case donated by the Rockford Park District was unveiled at the LZ Peace Memorial. Members of the Rockford Chapter NSDAR were on hand to participate in the event. The case was erected so that the faces of the Heroes were facing the granite wall bearing their names. At that time, only two pictures remained to be found. It was always our goal to find all the Heroes, so one last effort was made to locate families of the two remaining Veterans. On Memorial Day 2016, our dream of finding ALL the Heroes was met. 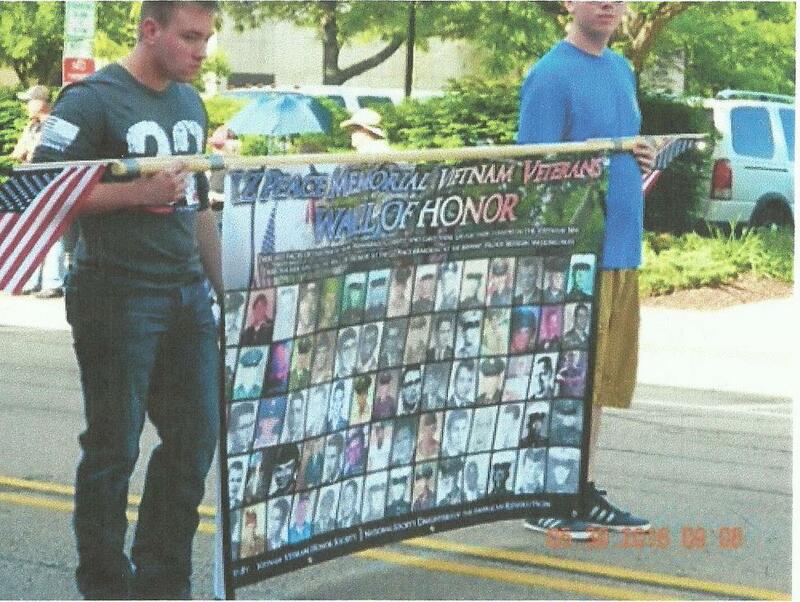 A banner, bearing ALL of their faces was carried by members of the Rockford VietNow chapter.. They “marched” in the Memorial Day Parade, surrounded by the men with whom they fought. Mission accomplished! Click here to find out about our next project at the LZ Peace Memorial - the Agent Orange Project. Honorary Regent Inis Bloomster was Chairman of the Faces of Heroes Project.